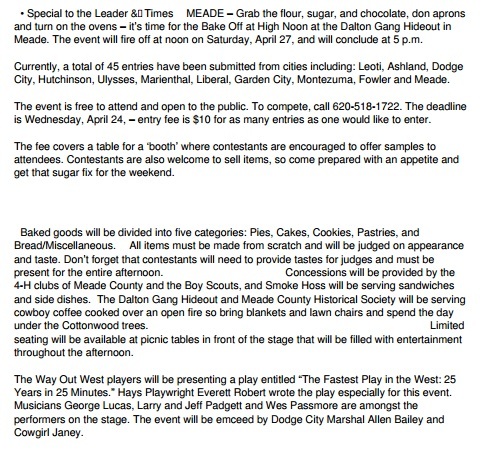 MEADE – Grab the flour, sugar, and chocolate, don aprons and turn on the ovens – it’s time for the Bake Off at High Noon at the Dalton Gang Hideout in Meade. The event will fire off at noon on Saturday, April 27, and will conclude at 5 p.m. Currently, a total of 45 entries have been submitted from cities including: Leoti, Ashland, Dodge City, Hutchinson, Ulysses, Marienthal, Liberal, Garden City, Montezuma, Fowler and Meade. The event is free to attend and open to the public. To compete, call 620-518-1722. The deadline is Wednesday, April 24, – entry fee is $10 for as many entries as one would like to enter. The fee covers a table for a ‘booth’ where contestants are encouraged to offer samples to attendees. Contestants are also welcome to sell items, so come prepared with an appetite and get that sugar fix for the weekend. Baked goods will be divided into five categories: Pies, Cakes, Cookies, Pastries, and Bread/Miscellaneous. All items must be made from scratch and will be judged on appearance and taste. Don’t forget that contestants will need to provide tastes for judges and must be present for the entire afternoon. Concessions will be provided by the 4-H clubs of Meade County and the Boy Scouts, and Smoke Hoss will be serving sandwiches and side dishes. The Dalton Gang Hideout and Meade County Historical Society will be serving cowboy coffee cooked over an open fire so bring blankets and lawn chairs and spend the day under the Cottonwood trees. Limited seating will be available at picnic tables in front of the stage that will be filled with entertainment throughout the afternoon. The Way Out West players will be presenting a play entitled “The Fastest Play in the West: 25 Years in 25 Minutes.” Hays Playwright Everett Robert wrote the play especially for this event. Musicians George Lucas, Larry and Jeff Padgett and Wes Passmore are amongst the performers on the stage. The event will be emceed by Dodge City Marshal Allen Bailey and Cowgirl Janey. Mark your calendars for April 27. 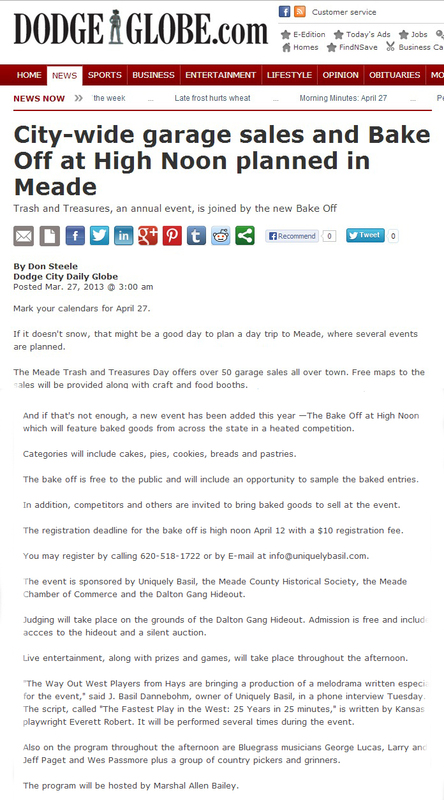 If it doesn’t snow, that might be a good day to plan a day trip to Meade, where several events are planned. The Meade Trash and Treasures Day offers over 50 garage sales all over town. Free maps to the sales will be provided along with craft and food booths. And if that’s not enough, a new event has been added this year —The Bake Off at High Noon which will feature baked goods from across the state in a heated competition. Categories will include cakes, pies, cookies, breads and pastries. The bake off is free to the public and will include an opportunity to sample the baked entries. In addition, competitors and others are invited to bring baked goods to sell at the event. The registration deadline for the bake off is high noon April 12 with a $10 registration fee. You may register by calling 620-518-1722 or by E-mail at info@uniquelybasil.com. The event is sponsored by Uniquely Basil, the Meade County Historical Society, the Meade Chamber of Commerce and the Dalton Gang Hideout. Judging will take place on the grounds of the Dalton Gang Hideout. Admission is free and includes accces to the hideout and a silent auction. Live entertainment, along with prizes and games, will take place throughout the afternoon. “The Way Out West Players from Hays are bringing a production of a melodrama written especially for the event,” said J. Basil Dannebohm, owner of Uniquely Basil, in a phone interview Tuesday. The script, called “The Fastest Play in the West: 25 Years in 25 minutes,” is written by Kansas playwright Everett Robert. It will be performed several times during the event. Also on the program throughout the afternoon are Bluegrass musicians George Lucas, Larry and Jeff Paget and Wes Passmore plus a group of country pickers and grinners. The program will be hosted by Marshal Allen Bailey. COLBY — Playwright Everett Robert will have his one-act play, “Allie in Wonderland,” published by Heartland Plays, Inc, and it is expected to be in their catalog by the end of the year. Everett Robert lives and has his roots in western Kansas. He graduated from Colby High School in 1995 and Colby Community College in 1999, where he studied Radio and Television Communications in addition to English and Drama. He has written and performed in Colby, Hoxie, Hill City, and the Philippines. “Allie in Wonderland,” a children’s play, is his first published play. More information about Everett can be found at http://www.emergencyroomproductions.net and http://www.facebook.com/emergencyroomproductions. “Allie in Wonderland” was produced and performed on March 26, 2010, in Hill City by students at Hill City Middle School. It was directed by Bill and Tonia Goodwin. 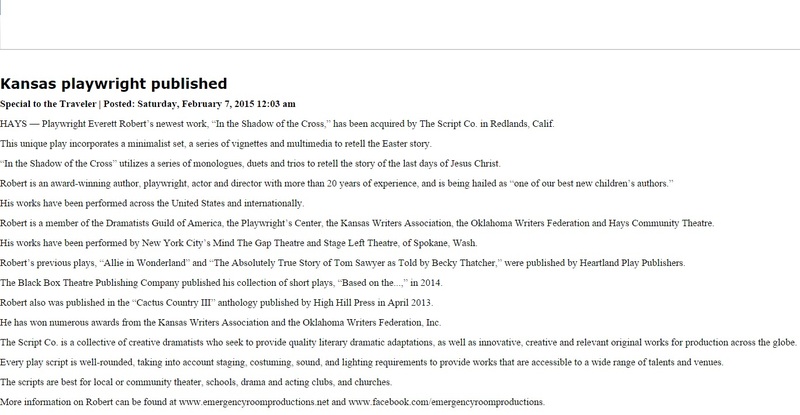 Heartland Plays publishes and licenses the performance rights and other authorized uses of quality plays, musicals and drama products through the convenience of online services. It is their mission to promote works for the benefit of theaters and playwrights alike. They are located at http://www.heartlandplays.com. 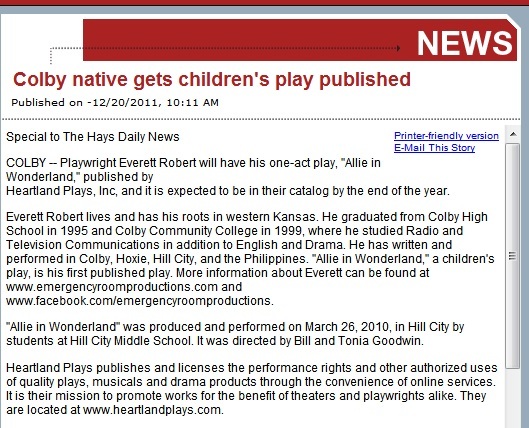 After answering a spur-of-the-moment request to write a short play in December 2009, Everett Robert of Colby has landed a contract to have his one-act children’s play, “Allie in Wonderland,” published by Heartland Plays Inc. Written as a sequel to Lewis Carroll’s classic story, “Alice in Wonderland,” Robert said, his version is set in modern times with a “tween” Alice hooked on her computer, iPod and cell phone. But now the cooler, older character goes by “Allie” and her imagination has been sucked dry. Desperate to help Allie regain her creativity and restore life into Wonderland, the rabbit brings the girl back while she’s out searching for a signal on her cell phone. The story takes place in Wonderland as a fictional entourage of characters tries and convince Allie that her imagination is vital to their world. Robert came through and the play was performed in March 2010 by students at Hill City Middle School, directed by Goodwin and his wife Tonia.